Our Marrakesh Style Tea pod drinks are a wonderful pick-me-up drink for any time of day. Our unique blend fuses green tea extract with a natural mint flavouring, for the taste of an exotic holiday at home. The result is an easy-going drink with the authentic sweetness and clarity you’d expect to find in Marrakesh itself. 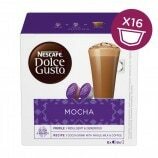 A great addition to any NESCAFÉ® Dolce Gusto® coffee pod collection, these capsules are made for tea enthusiasts and coffee drinkers alike. Lightly topped with our yummy NESCAFÉ® Dolce Gusto® froth, this striking tea is a wonderful choice to serve at any social gathering or to enjoy on your own, and is a wonderful palate cleanser after meals. Honey-coloured yet vividly clear, it also looks irresistible; try serving in one of our glass teacups for the ultimate ‘wow’ factor! Exclusively online, these tea capsules will bring an exotic and intensely enjoyable experience right to your own kitchen. And if you enjoy the taste of the Marrakesh Style Tea pods, our subtly spiced Chai Tea Latte might be just your thing as well. Sugar (95.5%), Green Tea Extract Powder (3.4%), Natural Mint Flavouring, Vegetable Oil (Palm, Palm Kernel). May contain Milk and Soya. I love this tea! I agree that it did seem too sweet when I first tried it, but now that I am used to it, I find it really refreshing, with a great taste, a mix of citrus, mint and honey. I love it! Absolutely adore this tea. Such a fresh minty taste. Perfect way to start the day! I like different kinds of tea so I thought I would give it a go. Oh dear. All I could taste was bubblegum. Such a disappointment. Smells great but taste is far to sweet for me, I can't make my way through a whole cup. I love Moroccan green tea and drink it regularly. So when I saw this I just had to try it. What a disappointment. First off it’s way too sweet and sickly. It’s rather thick and rich. It just taste like it’s full of sugary sweeteners . I tried two pods to see if would improve the second time ~ it didn’t. I wish I could send it back but it would cost more in postage. Disappointed customer. I have a sweet tooth, and this is just lovely to wind down after a busy day with my toddler without having a coffee. One of my favourite teas without a doubt, I've ordered again!